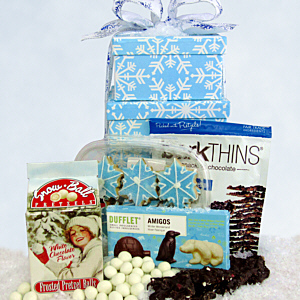 Cool Treats create a winter wonderland in our Snowflake Stack. Starting from the bottom up, we have gathered: Gianna's Handmade Snowflake Sugar Cookies, Frosted Pretzel Balls (addictive), Winter Amigos (a Penguin, Polar Bear and Igloo in Chocolate), and our Fair Trade Chocolate Coconut Almond Bark Thins. Let it Snow!